For most, the journey to connect their family trees in Pomerania has been a struggle due to archival restrictions, privacy laws, and decades of the Cold War. More recently, with the expansion of high-speed internet and the renewed interest in family history, records from Pomerania are slowly being digitized for global access. This brings into question how researchers will be able to search through these pages quickly and efficiently, especially given that more and more people are unable to read the old German script. It was recently revealed by the Pommerscher Greif at their 2018 Greif Seminar in Bochem, Germany that their searchable database already contains 740,000 entries. The working title for this project is the “Greif Index,” containing a majority of its data entries (an estimated 90-95 percent) from the Koszalin (Köslin) State Archive’s indexing project. The database also contains a smaller segment of its records from other sources available online, including from Greifenberg and Greifenhagen’s Standesamt indexing projects. This highly anticipated project appears to be the culmination of several years of hard work from genealogists working in coordination with the archives to bring sought-after records into public use. For the last few years, researchers have relied on the Polish PTG’s indexing project to look up ancestors. Civil record books have been digitized and made available through Metryki Genbaza, which appears to be the current standard for digital storage and retrieval. Other Heimatkreise have taken the initiative to go one step further and introduce more information in their searches to aid in narrowing searches. The Heimatkreise for Kolberg-Körlin and Stolp have taken extraordinary steps to make their databases extensive and powerful tools. From what has been revealed, it is assumed the Greif Index will feature search results through a user interface similar to Kolberg’s person search database. Currently, the Greif Index is in its beta-testing stages and can only be accessed by members of the Pommerscher Greif through its protected portal. While the Greif Index and Metryki Genbaza data will be accessible to researchers world-wide, it brings into question the accessibility for those on slower internet connections or without internet access at all. As of 2018, Metryki Genbaza functions fairly quickly to load individual pages. However, at peak times, accessibility can reach crawling speeds, much to the frustration of family historians. The question has also been posed about permitting downloads of complete books for offline viewing, as these can be read more naturally when accessed via tablets and mobile devices. With so much Pomeranian data being digitized by the various holding institutions, researchers should also question what the next logical step should be. Guild records? Land registers? Newspapers, Amtsblätter, or place history books? However important these questions might be, they lie in the background while much work is yet to be accomplished through the current indexing project. 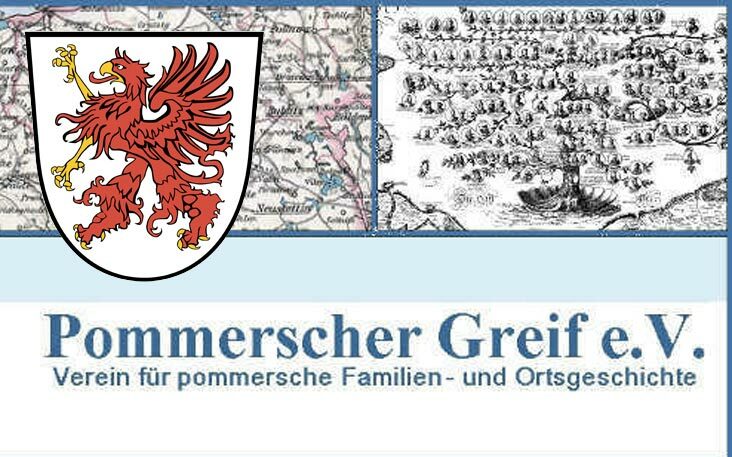 For more information, please read the update from the Pommerscher Greif. For readers who are unfamiliar with the German language, use Google’s Chrome web browser and right-click on the page to translate it to English.